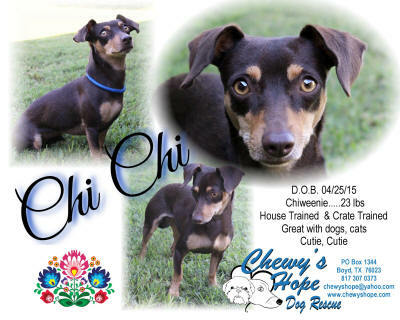 Adoptable Chewy’s Hope dogs are fully vetted and health guaranteed. personal attention and evaluation of their temperaments. If you have any questions you can contact us by Facebook or e-mail. 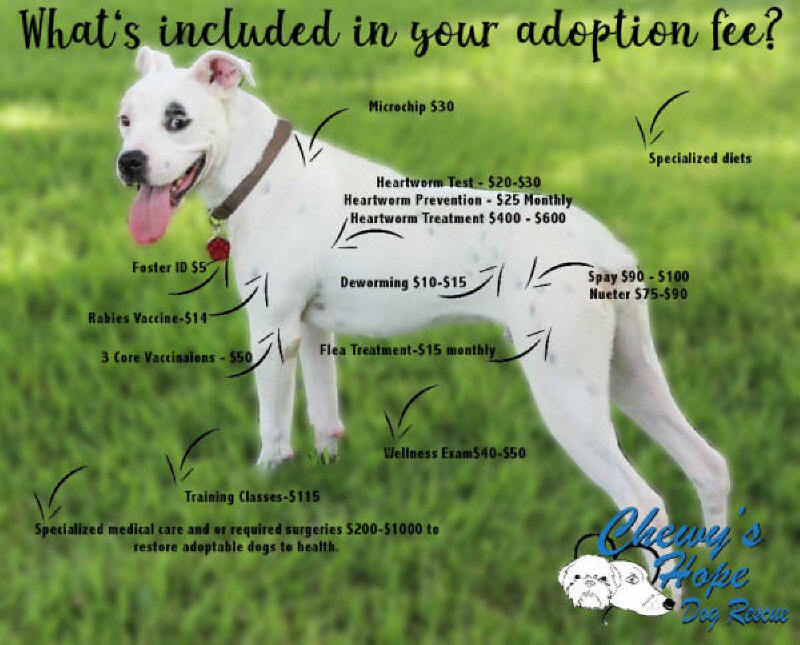 list of Adoptable and Soon To Be Available pages. 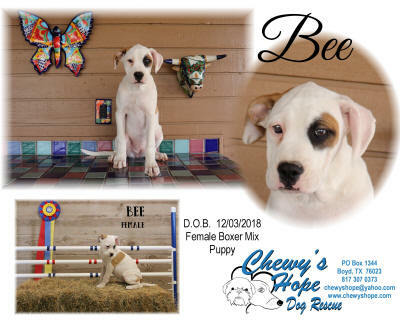 It can either be electronically submitted attached to an email to chewyshope@yahoo.com. My name is Pippi Longstocking and my middle name is ENERGY! I am a one year old puppy who loves to explore. Sniffing is my favorite hobby! I love to be outside running and playing but I also enjoy just sitting on the couch watching TV. I arrived at the local shelter with a bad bump on my head. The doctors said that someone might have been mean to me. My history remains a mystery. But I do have a happy-go-lucky personality and everyone is my friend despite the past. 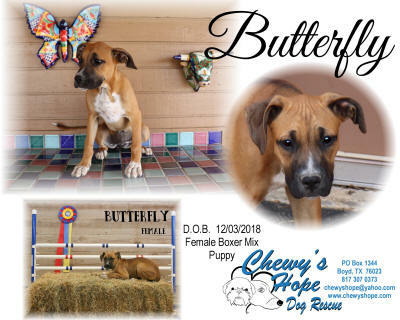 My dream would be for my forever home to have people that will practice obedience training with me, give me lots of exercise and bunches of attention. I catch on quickly & I already know sit and stay. Sometimes I get excited and tend to jump up and because I am a “sturdy” girl, it might be best if my forever home is without small children. Once you meet me, you’ll fall in love with me. Won’ t you give me a chance? Found on Christmas Day… he is an angel. 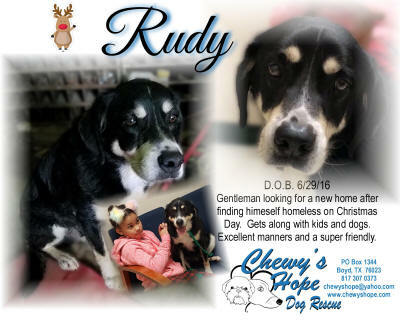 Rudy is about 1 ½ years old mix breed. He is the gentlest of souls. This little guy is house and crate trained and walks well on a leash. He likes to be close to his companion and just wants to be loved. He is good with kids and other dogs. Rudy is looking for his forever home with his own human to love. 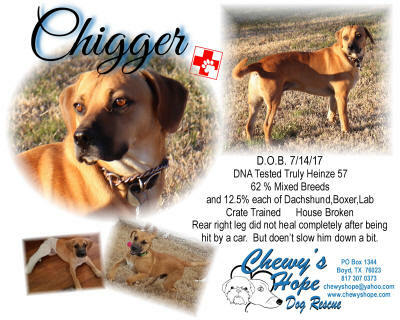 PUPDATE: Chigger's leg was saved leaving a small impairment that does not slow him down a bit. He graduated puppy classes at Dancing Dogs. He weights 48lbs now. Hi, Chigger here. Well, things didn’t start out too well for me but they tell me it will get better and better. No one seems to really know where my story started except that some humans brought me into a doggie hospital and said that I had been hit by a car. I’m just a little guy, you know, just a puppy so that was bad. My leg was broken and they said that they couldn’t pay to fix it so they told the doggie doctor to just “put me down.” Now, I didn’t know what that meant but that nice doggie doctor got a really funny look on her face so I don’t think it was a good thing at all! She told them, no, to just let her have me so they left me there. The nice doctor put a splint on my leg and gave me a place to stay. The ladies at Chewy’s Hope happened to see me at the doggie doctor’s place and said that they would take me. It’s been a pretty good gig since then but my leg was broken through something called the “growth plate.” I don’t know what that is but I can’t bend my leg since the cast thingy came off. My nice foster mommy is taking me to a chiropractor to see if he can help. I can’t spell that much less know what it is but foster mommy says he might can help. She says that there will be a forever family that will love me no matter what my leg looks like. I really hope she’s right. Will you be my forever family and love me even though some would say I’m not perfect? I promise to love you forever! Please love me forever. Our dogs have been fostered in homes where they receive personal attention and evaluation of their temperaments. Meet Hero. 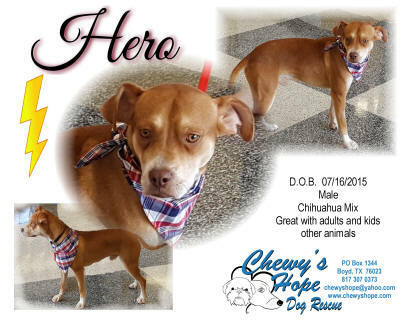 If you are looking for that sedate quiet gentleman who loves kids, spending time on the couch with the family and just hanging with his peeps...………...Hero is your guy. Pick me! Pick me! Pick me! Hey over here, pick me! My name is Hero, and I'm a really good boy. I need a new family because my old family decided they didn't want me anymore. Sniffle, I was left at a doggie jail called a shelter or something like that. I heard some of the humans saying I was on the EU list for the next morning. I didn't know what that was but I don't think it was anything good. At the last minute, Chewy's Hope stepped up and saved me. Whew, that was close! I went to something called a foster home and the lady is really nice here and there are little humans, cats and even a snake to play with! I have to admit though, that snake scares me a little. I am crate trained, house and leashed trained. I am still a youngster so I like to chew a little. If my humans can't watch me, I would need to be in a crate, at least until I outgrow this crazy addiction of mine to shoes and things like that. Bet you didn't know I am a real hugger too! I love hugging everyone! Sit next to me and I will crawl into your lap and hug and love on you. See, now you know what an awesome little guy I am! So come on, fill out that adoption app. You know you want to! I was all alone and wandering the streets, waiting to have my babies. I was scared and lonely. A kind lady found me and took me home with her. She became my foster mom for Chewy’s Hope. They gave me a name, Chi Chi. They were nice to me but I was so afraid. People had not been kind to me. The Chewy’s Hope ladies took me to the doggie doctor, who said my puppies were too big. You see, I’m just a little girl. Just a few days later, I started to have my puppies. I had to be rushed to the doctor for something called a C-Section. My babies were born early and even though everyone tried really hard to save them, they died, one by one. Now it is just me. I have been with my foster mom for some time, trying to learn to trust people again. I have come such a long way but can still be a little skittish at first. For that reason, I would probably need a family with children that are a little older. I am a sweet girl who needs a family that can show me that not all people are bad. I just want a warm lap to lie in and someone to cuddle with. Will you be my family? Please? Arlo will be available soon. He needs to finish his vaccinations and have his neuter surgery. Hey world! 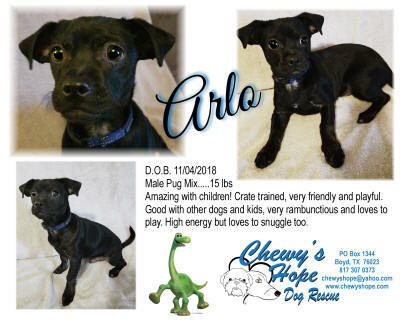 My name is Arlo, and I am SO excited to meet you! I just adore any and all human attention I can get, especially from the smaller ones. I hear they are called "kids", and boy do I enjoy playing with them! I also enjoy other 4-legged friends to wrestle and run with, it doesn't matter if they are big or small like me, I love them! The ones who say "meow" aren't that bad, either. Toys are such a blast to play with, and even though I am still learning how to bring the toy back, I love playing fetch! I sleep like a good boy in my crate, and have had 0 accidents in it! I am very proud of that one! Even though I am a young one still, at 4 months, and have lots of energy I also love to snuggle up in your lap and take a nap. I'm learning basic obedience (and nailing it!) and sit very handsomely for treats. My last "family" decided they did not want me any longer, so now I am ready for one who will love me for the rest of my life! Is it you? 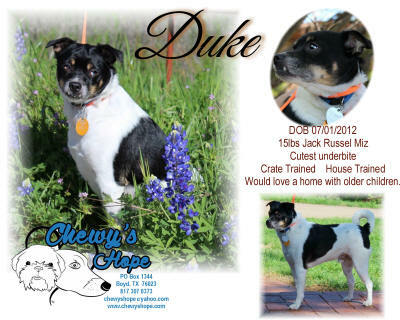 Duke loves children and has the most adorable underbite! Please meet Olive, our newest Chewy's Hope baby. 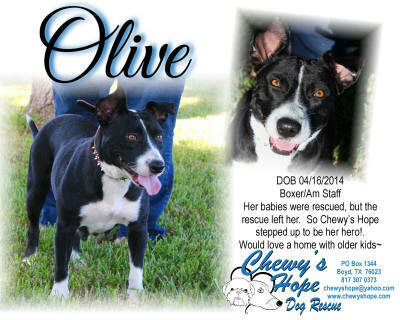 Olive came into a shelter down south pregnant and heartworm positive. She was fostered until her babies were born and weaned. Her babies were then transported to a rescue. For whatever reason, Olive didn't get to go with her babies and was taken back to the shelter where she wound up on the EU list. I happened to see her picture late the night before she was to be Eu'd and knew that we couldn't let this beautiful little girl die. With the help of several amazing ladies, we were able to get Olive from Corpus Christi into our hands where she will get the treatment she needs and will never wind up in a shelter again! Thank you ladies for all your help! You know who you are. It never ceases to amaze me what can be accomplished when everyone works together with the welfare of dogs first in mind. Thank you EVERYONE who had a hand in saving this precious girl! Skippy is a very happy, energetic boy. He the crate trained, leash trained and house trained. Skippy love his ball and playing catch is a must. He will catch his ball before it even touches the ground or out run it when thrown. All this boy needs is his ball and a whole lot of love. 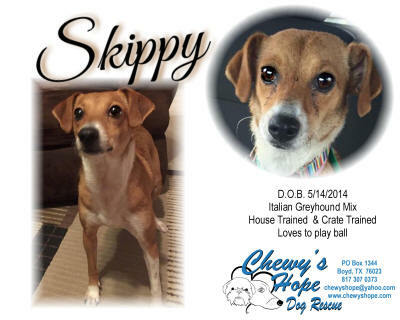 Skippy was saved from the Wise County Animal Shelter. He was picked up as a stray. Pictures make this boy look bigger than he is. At only 16.6 pounds, he is mostly legs and boy can he move them. This is a fast little guy when he is playing. Skippy came to us heart worm positive, but has gone through treatment. 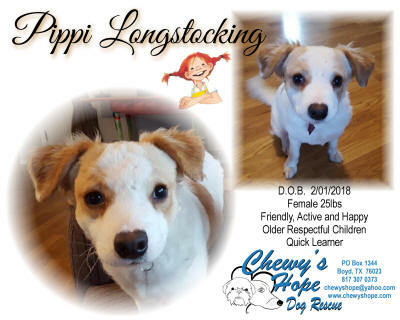 Looking for a cute small lap dog? Well here he is! 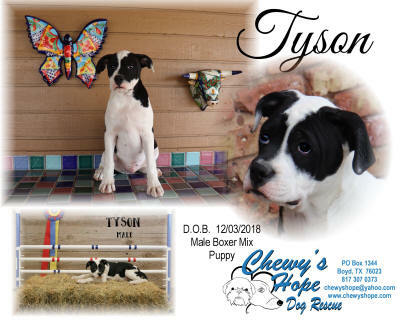 He would love a home with other dogs & a big yard to play in. He loves to be outside when the weather is nice but when he’s inside, he likes to be under a blanket with you snuggling. He’ll do best in a home with older children & he’s been around cats also. 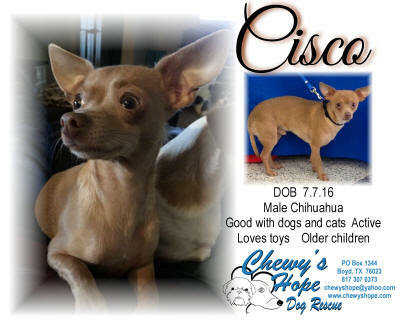 This is Cisco & he's now ready for his forever home. He's had all his shots, neutered, microchipped & on heartworm prevention. Cisco is the perfect, sweet lovable lap dog! 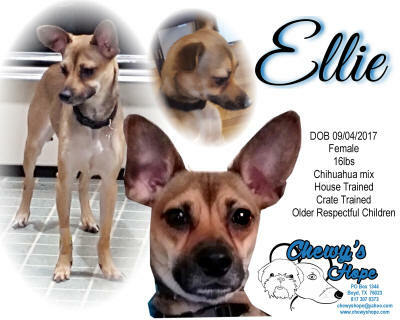 Hello: My name is Ellie and I'm the most loveable, smart "velcro" dog around. I was an owner surrender because they didn't have time for me and I had to be kept crated for several hours a day. Because they believe I am part Whippet, I am an extremely active dog and have the need to run and play. Whippets are considered "sight hounds" and normally shouldn't be allowed to be off leash unless it is a fenced or secured area. If I see something, I'm gone so best to keep me close to you. Because of my need for speed, an agility class will be right up my alley. It would be a great way for us to bond too. I am also super affectionate. I love to be next to you whether it's sitting on the couch or on the floor next to your feet but being able to sleep next to you in the bed is my favorite place! Kisses are always in order and I give LOTS. I would like to mention that I tend to cower when a harsh voice is used. I'm used to quiet and loving words and lots of praise. I am very smart too. I learn commands quickly especially if there are treats involved! So far, I have learned to sit and wait but the wait command is the hardest for me. I have a hard time sitting still. Too much energy to burn! The home where I am currently living has 5 cats and I get along great with all of them. I do not chase or taunt them but given the chance I will push my way into their food bowls. Cat food is pretty tasty! My dream of the perfect home is one with loving, active humans who will spend time with me. Take me to the lake, hiking or just riding in the car...l just want to be close to you! Won't you please consider taking me home?